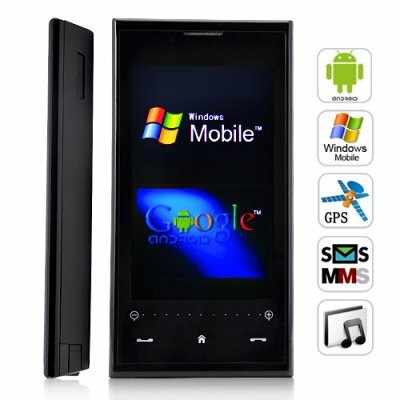 Successfully Added Windroid - Windows 6.5 Pro + Android Smartphone with GPS to your Shopping Cart. For the first time ever you can take advantage of today’s two best operating systems in one powerful and compact cellphone. For business people on the go the Windroid features the latest Windows 6.5 professional OS. This allows you to easily sync this phone with Outlook Express email as well as edit your Excel, PowerPoint and Word files all while away from your desk. When work is over simply select the popular Android OS and let the fun begin! The WinDroid provides a truly enjoyable experience that is sure to satisfy the senses. This is accomplished by using a colorful and vibrant 3.2 inch touchscreen that responds instantly to the slightest touch of your fingertip or stylus. The touchscreen sits flush into the phones all-flat surface and makes “sliding and sweeping” your finger to browse through web pages, photos, and eBooks both easy and convenient. The in-hand feel is very comfortable too. That’s because this smartphone is only 14mm thick and is ergonomically designed so that only a single hand is needed to access the entire feature set. Another highlight is the touch-sensitive flush mount buttons located on the bottom of the phone which provide you with quick access to the call, end call and menu functions. The buttons vibrate when pressed and provide a unique look and feel to this already attractive cellphone. Tech junkies will be pleased to know that the WinDroid is no slouch; let’s take a look inside. At the heart of this device is the time-tested Marvell PXA310 CPU running at a swift 624 MHz. This is more than enough power to enjoy CPU demanding tasks such as watching your favorite high resolution movies, rendering complex webpages like YouTube or playing the latest video games. The WinDroid also features a powerful 802.11 b/g wireless card for lightning fast internet speeds as well as the Inner Sirf III GPS chip for use with your favorite GPS software. Powerful enough? We think so. Due to space limitations we cannot talk about every single feature this smartphone has to offer. But additional highlights include: full Bluetooth support, a true 2 megapixel camera/camcorder that captures beautiful images, GPS compatibility with popular software like TomTom and iGo, full Google Maps support, Skype support, MSN support and a powerful multimedia decoder for enjoying videos, photos, music and eBooks. The WinDroid smartphone offers all of these and many more high quality features that are sure to keep you entertained, increase efficiency, and keep you at the forefront of technology. Let’s face it. Both Windows and Android have their distinct advantages. And until now you where stuck having to decide between one or the other. Thankfully, those days are finally over. Take this opportunity now to own an Android and Windows 6.5 Pro smartphone at the same price it would cost you for a good Android phone. To be frank, this is quite possibly the best value smartphone we have ever seen here at Chinavasion, or anywhere else for that matter. If you plan on getting one soon we advise you to order quickly while supplies last. And remember, all products from Chinavasion include our hassle-free full 12 month warranty. Access hundred of free apps, games, ringtones and more with the AppBrain Marketplace! Note: Any alterations such as upgrades or flashing the cellphone and installing a newer version will void the cellphone's warranty. However, advanced users have reported successful upgrades to the latest Android 2.1 operating system. The Android operating system is stored on the micro SD card. If you plan on changing the SD card make sure to copy the contents of the original card over to the new one. Use the UP/DOWN button on the side of the phone to select between Windows or Android during the startup screen. Can What are some good marketplace applications for this phone? Check out our blog [http://blog.chinavasion.com/index.php/5810/chinavasion-and-the-search-for-the-android-smartphone-apps/] for a complete list of the best marketplace apps for this phone, or any other Android phone. Can I get my company name and logo printed on this product? Yes, if you are able to order 250 or more pieces then we can arrange that for you. on 2010-10-15 03:15:12 I am so HAPPPYYYYYYYY!!!! I bought the phone on the web on friday, i got it on Wednesday in NYC!! Two batteries, extra stylus, bluetooth headset.... I was scared and keep all the boxes in case i have some problems, both windows and android working great. Worked great with ATT and Verizon sim cards. Connected to my PC and downloaded all my appointments, contacts perfectly. I also installed all the previous windows apps of my previous phone. My third time i bought from this store. I am so HAPPPYYYYYYYY!!!! on 2010-10-01 09:15:43 I like it! Best of both worlds with Windows and Android, I use this mostly in windows. Seems just a little slow online using GPRS. Extra stylus is handy, also supplied with a car lighter adaptor. This is a genuine dual boot android and windows phone, it's not just a theme phone, supplied with both operating systems on the Micro SD card, as stated, with a windows serial/key on the CD. Overall, nice phone, I like it, recommended!! on 2010-09-19 20:26:46 Uvelichte parameters! Uvelichte parameters! Hotyaby before average! Then has bought with pleasure! Great little phone! Both Windows and Android work great with very little lag. The camera is only 2MP, but over all it is a good phone. After a few hours of Googling around I found a thread at forum.xda-developers.com that helped me upgrade to 2.1. I could not remember the exact link, but if you search the forums you can find it. Thanks Chinavasion, peace! on 2010-09-12 22:44:33 Very promising device! That realy seems like the pioneer of dual boot devices, looks realy promising!